I’m only kind of kidding…. It may have evil procrastination powers. What I am really trying to say here is I have come to the decision that I need to get myself a real desk. What I have right now is an underused table covered in crap I threw on it and forgot with a kitchen chair. 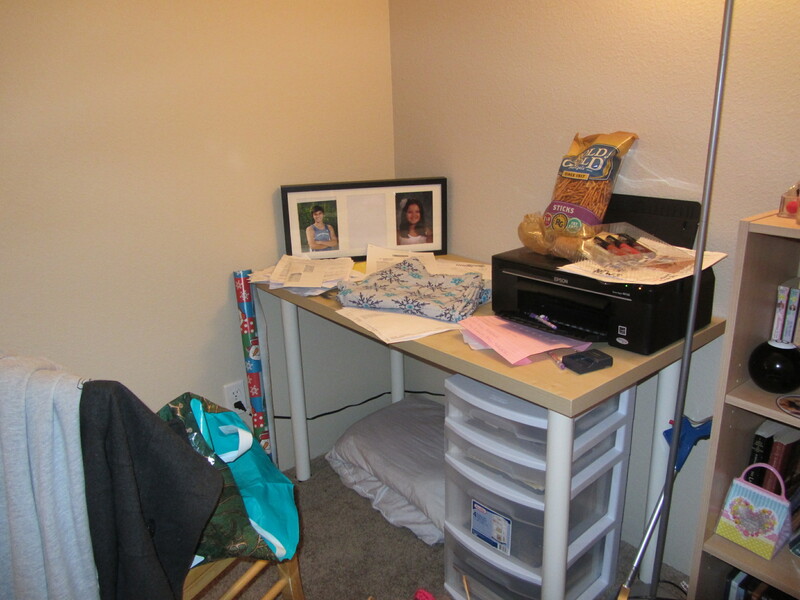 Even when I was first organizing my room I was wondering why I was putting a desk in my there, I knew I wasn’t going to use it… look at it! Clearly not at all usable and, as I was saying earlier, my bed is evil. Whenever I lay down on my bed intending to work I mysteriously end up on YouTube or DramaFever and 3 hours have passed without me writing a single word. But recently I showed up at a coffee shop early to meet my writing critique group, more on that later. By the time the meeting started an hour later I had finished an amazing 3 pages! They will probably have to be heavily edited but they were still there on the screen and not in my head! So I have decided that I need to actually clean off my desk and get a chair in front of it that I can stand to sit in for more than five minutes at a time. Until then I may become a near permanent feature at the Denny’s closest to my house.